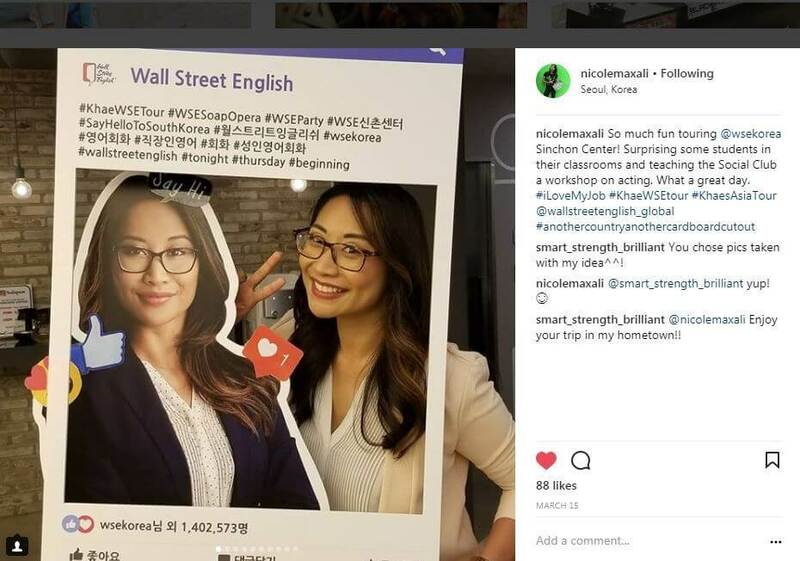 English learners at Wall Street English centers in South Korea, Hong Kong and China were given a treat recently when one of the stars of the WSE edutainment TV series visited to give some motivational acting workshops. Read on to find out more. 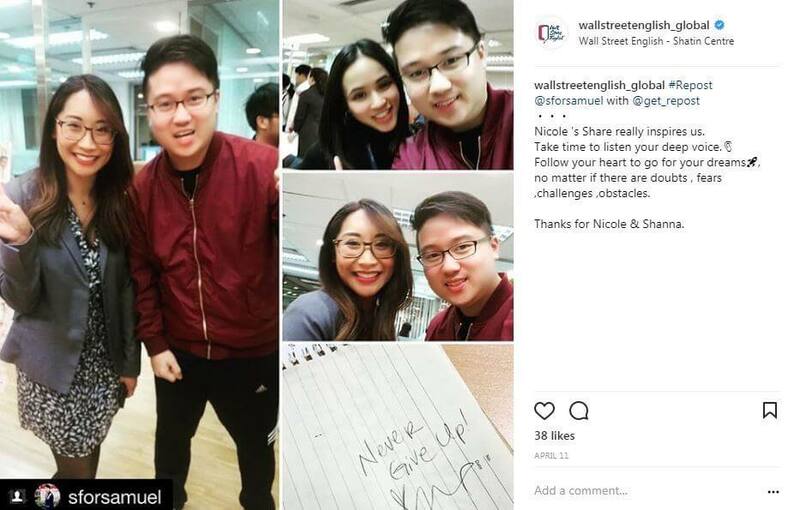 Thousands of English learners were inspired recently at Wall Street English centers in Asia through a series of motivational speeches and interactive workshops from Nicole Maxali, the American actor who played a lead role in the 80 episode TV series that makes up the WSE course. Nicole’s character Khae is one of the main characters in the TV series that helps WSE students to learn English over the course of 20 levels from beginners to advanced. Students follow her journey of discovery as she pursues her dreams in New York. The events in the WSE centers included Nicole giving a motivational speech about how she has overcome difficult situations in her life to keep pushing forward. This can be related to learning English and the support learners get from the team in a Wall Street English center. Nicole also ran an acting class sharing some top tips from her experience as an actor and producer in New York. Nicole even went out to visit some of the sights in the cities she visited including Busan, Seoul, The Hong Kong Flower Show and The Peak, The Bund in Shanghai, The Forbidden City and even the Great Wall of China! 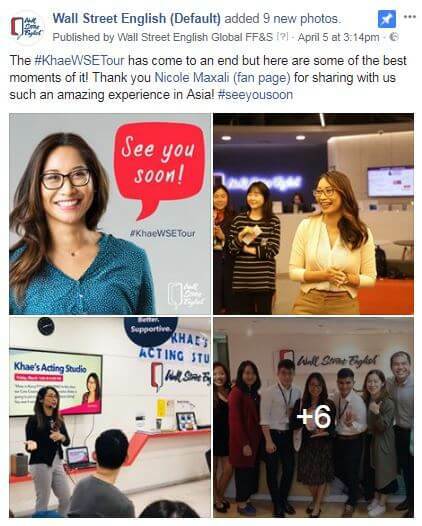 We’ll leave the last word to Nicole (or Khae)! Wall Street English (WSE) is one of the largest providers of English language education for adults around the world. In 2018 WSE operated over 400 centers in 28 territories around the world. www.wallstreetenglish.com. See more about Our Courses and Start Learning now! Joe is the Marketing Content Manager at Wall Street English International in Barcelona, Spain. His career has spanned Government policy advisor roles, English teaching & teacher training and now digital content marketing. He is from the UK originally but now spends his free time cycling around Spain, enjoying fine food and DJing!